KIDS for the BAY collaborates with teachers to connect students with nature, inspire environmental action, turn students on to science, and create lasting impact. “I didn’t know we were going to get to see a kingsnake!” exclaimed eight year old Summer Camp Explorer, Alison, as a spectacularly large snake was carefully placed on the ground in front of her. Zoology week sparks a love for animals and wildlife, as campers learn all about the animal kingdom. 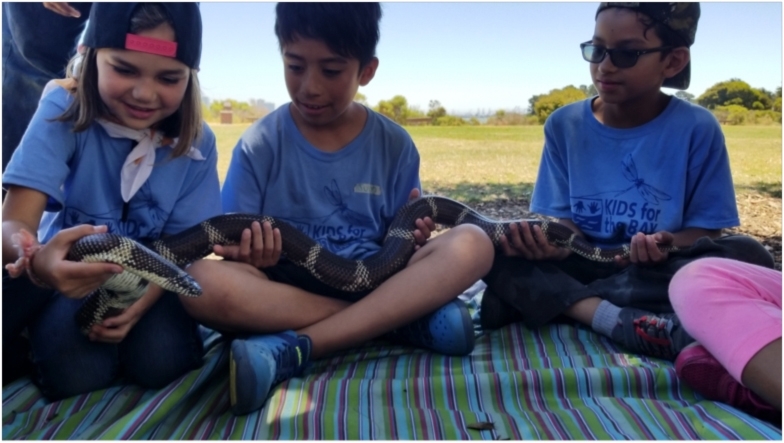 From meeting local Bay Area animals at the Lindsay Wildlife Museum to discovering exotic animals, like ternecs, which many campers had never heard of at the Oakland Zoo, every day was an adventure! 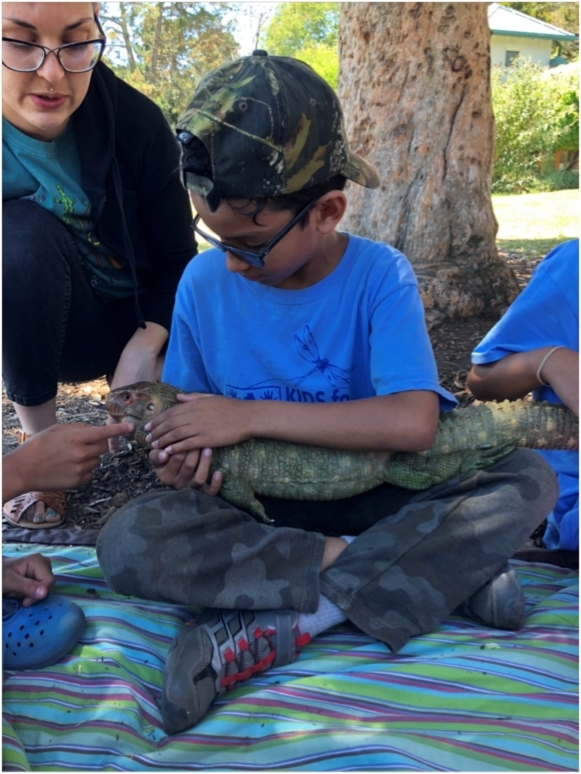 During an exciting visit from Lick Your Eyeballs, a hands-on live animal program, focusing on reptiles and amphibians, the campers were introduced to Turok the Caiman Lizard (Dracaena guianensis) and Zeus the Crested Gecko (Correlophus ciliatus). Their favorite, however, was Emily, the Eastern Kingsnake (Lampropeltis getula). They were thrilled at the opportunity to meet Emily and carefully hold her! “Kingsnakes can eat an animal the width of its body,” Kai shared. “Her scales are so bumpy!” said Stella. The campers learned that kingsnakes get their name from their diet of other snakes and that they are even immune to rattlesnake venom! “I learned that not all snakes are slick and slippery,” shared Mia. More important than just connecting students to amazing reptiles, Lick Your Eyeball and KIDS for the BAY worked together to teach campers about respecting wildlife by increasing understanding and knowledge of organisms’ natural needs and behaviors. Thank you Lick Your Eyeballs and Turok, Zeus and Emily!